Download “Unbranded” Versions of those videos to use at your church! [Click here to download now!] Just leave a comment to tell us you’ve used them! Make Room For New Friends! // We’re mainly appealing to people’s altruistic sense with this sub-message. 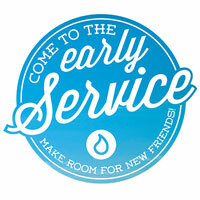 Our hope was to reinforce that coming to the early service is a way to serve guest who aren’t here yet. Direct Mail // We sent a 6×9 direct mail post card to every family in our database. This piece was straight forward, clean and had a direct ask. Please come to the early service. Our hope in landing this at home is that it’s a reminder while people aren’t with us to think through a different Sunday schedule. Spring Catalog // We dedicated a full page spread in a spring mailing to 5,000+ homes to this campaign. [Click here to read more about our spring catalog and what we’re attempting with this piece.] Our hope is that as people as people are looking through all the things going on in our church this spring they will be reminded to try an early service. Email Calls Out // We send out a email every week to our database highlighting what is coming up our church … we’ve been communicating this messaging through that channel. This is an important reinforcement because it lands on Friday … getting people to think through their weekend and how they can help us make room for new guests. Two Funny Videos // As a part of our “video announcements” package that we show at every campus we made two 30 second spots that we’re designed to make people smile and to deliver the message that we need them to come early. You can see links to these videos at the top of this post. These went over great! I love hearing people laughing in church. Good for the soul. Pastor Call Out from Stage // Finally … at the end of a series our Lead Pastor made a quick call out about the next series and the fact that we need people to move to the early service. [Watch the last 2 minutes of this video to see it in action.] My sense is that so many people start with this one … they think if they just get the person who talks on Sundays to plug their need it will translate. That’s just not necessarily true. Of course, whatever the Pastor says does carry a lot of weight in a church but I think we can over depend on that. I’m happy that he didn’t need to land it on heavy … all he needed to do was give his perspective on the next series. He gave people an insight into the direction of the series and asked people to move to the early service times. Because we’ve done everything else in this campaign he was able to focus on the pastoral part of what he wanted to teach on … not on the nuts and bolts of the service time change. What have you done to ask people to switch to a different service? I’d love to hear your ideas! Let a comment. Very timely and helpful tips. We’re in the process of phasing out our Saturday night service and adding two evening times on Sunday to accommodate growth at one of our campuses. We have to isolate our communication to attenders of that one campus, but many of these ideas are still applicable. I like that you promote being direct and clear with the messaging by simply telling people what you want them to do. I sometimes think we make the messaging too obscure… Don’t make people guess what you want them to do! Have a great week. I’d love you to drop back and tell us how it goes! Rich…you’re my hero bro. Thanks for sharing so much of what you guys do! Rich, we’re facing this issue right now at our church! Are you aware of any studies/surveys that have been done to validate the “optimal inviting hour” for visitors?